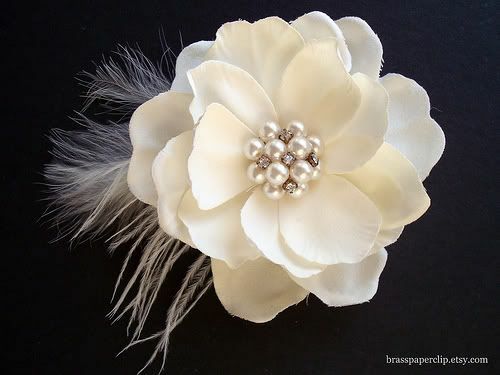 The two hair accessory projects I made for the ladies of the wedding are nice bookends: Ashley’s hair flower was the first project I did and the headbands for the flower girls were a last minute project right before I shipped everything off. Ashley found the hair flower below from Brass Paper Clip on Etsy for around $40. She asked if I could do better. Together we went to Eastern Market in DC and found a vintage brooch for $6. I would like to give Ashley a lot of credit for finding this little gem. 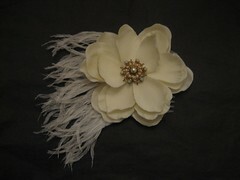 I then bought the magnolia and feather trim from two different Etsy sellers for $11. This is one of the few times when not having a car or a Metro accessible craft store makes things difficult. This project would have cost significantly less if we could run to Michaels. I would like to take a brief moment to discuss the integrity of the Internet. 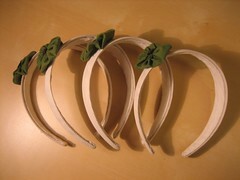 I know a lot of crafters and artist argue the integrity of creating a product that is a direct copy of another’s work. I would not encourage others from doing what I did. This flower was a gift for personal use. I made a simple fabric yo-yo with the leftover green fabric from making the men’s ties (to be revealed tomorrow) and finished them with buttons from my stash. Buttons I bought for about 35 cents a package when the Jo-Ann Fabrics on Burnet Road in Austin closed four years ago. Yes, I hesitated about loosing using them on this project. 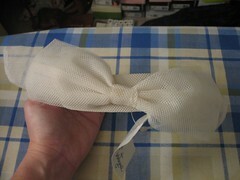 I removed the original tulle bow from the headband and sewed on the fabric yo-yo. 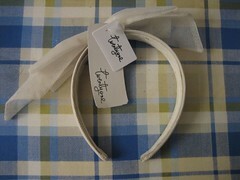 Three out of the four flower girls successfully wore their headbands on the wedding day. 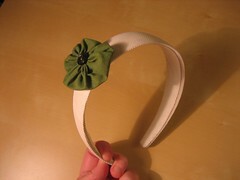 I complimented one of the little ladies on such a beautiful hair accessory. She politely thanked me. And the Fiancé totally called me out on complementing my own work.